The month of September just flew by! It has been a busy time with the opening of school activities, but it is evident that the students are happy and the atmosphere in the school is one of excitement. The staff is terrific and every day I see examples of how much they care about the kids. We are also grateful for the parent involvement in the school – from our crossing guards to garden group, hot lunch team and everyone who worked so hard towards the success of our Back to School BBQ. It is evident that St. Edmund’s is a fantastic community! This month our teachers will be preparing our students to celebrate Thanksgiving. We encourage you as a family to pray and help those who need it the most. Celebrating Thanksgiving encourages us to move beyond being thankful to having an active concern for the poor. The poor teach us the true meaning of gratitude. Those who seemingly have nothing can pray as though God has given them everything, that is faith. How can we make other people’s Thanksgivings special? Who would benefit from extra attention at Thanksgiving? Give your child the opportunity to name what they are grateful for and to ask God to help the less fortunate. On behalf of the staff I would like to wish all our St. Edmund’s families a blessed Thanksgiving. o our junior and senior volleyball teams and our senior soccer team who have had a great start to their seasons! 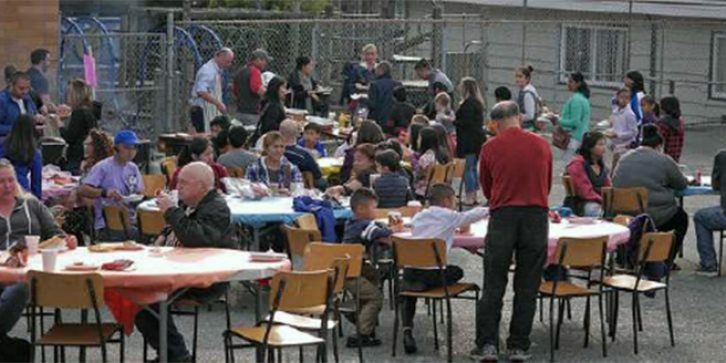 Thank you to the students, parents and volunteers who took part in our very successful Back to School Barbeque. Special thanks to our organizing parents who made sure that everything ran like a fine-oiled machine! To the parents and students who have come out on weekday nights and weekends to beautify our front school garden! When Parents Have Concerns – If at any time you have a concern regarding your child, a school event, a staff member, or an incident that happened, we ask that you please come and speak with your child’s teacher. The only way that concerns can be effectively resolved is through open communication between home and school, resulting in accurate information being shared, and an informed understanding of your concern. normal, or after gastrointestinal illness (vomiting/diarrhea); contagious infections such as suspected pink eye or strep throat; unexplained skin rash; severe cough and cold symptoms. Exercising proper hand washing techniques is also crucial to helping prevent the spread of viruses. This will go a long way to keep our student and staff population happy and at school. Birthday Celebrations – If you wish to have your child share a special treat with the class on his/her birthday, you are welcome to send a small allergen-free treat that the teacher can hand out at the end of the day. We have a number of students who carry Epi-Pens for food-related allergies, so all treats must be free of allergens according to our school policy on anaphylaxis. Please help us keep all our students safe. The parent volunteers are organized, the route is planned, and spirits are high. It’s ready, set, go! for our Walkathon this Friday. This event is our major fund-raiser for the year. Over the past years the school has been able to purchase and update educational tools and materials for the school’s growing needs. This year’s $20,000 goal will enable us to upgrade our technology resources as well as provide new resources for our fine arts and athletic programming. go in to this successful fundraiser, and we are grateful and appreciative of her gift of time and talent. To all the parent volunteers at the park, walking with the classes, riding along the route, and helping your child fundraise, we couldn’t do it without you. On behalf of the school, we thank you! Please note that you can have family and friends donate online using the CHIMP fundraising website. See St. Edmund’s Elementary – Walkathon 2018, or click on this link. Remember, pledges of $20 or more are eligible for a Charitable Tax Receipt!